I’m not sure I can muster up much to say about this book. I can tell you a cute story about how I came to have this book in my hands: I put it on hold at my library, therefore forcing the person who was currently reading it to bring it back in a timely manner. At the same time, someone pulled the same stunt on me, with The Luxe. I sighed loudly and said, “FINE, I’m not going to read this right now, so you can have it back.” I printed out the hold slip and saw it was requested by one of the pages who shelve books at my library. 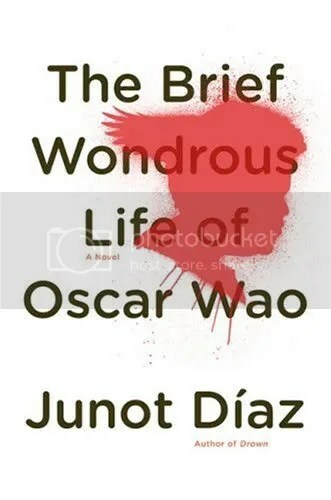 I slid the book into her mailbox, and a few hours later, she approached me at my desk, holding the copy of The Brief Wondrous Life of Oscar Wao she was also forced to return. Anyway. Along with deciding to read more classics, at some point I decided I needed to read more of Those Books That Everyone Talks About. This was at the top of Every Important List. I first opened it while sitting in a traffic jam on I-94. Eastbound. The first character you meet in Diaz’s ever-broadening world is Oscar, an overweight, sci-fi fanatic living in Jersey with his Dominican mother and alternately wild-child and academic princess of a sister. The book branches off in various directions, most of which are narrated by an amusing yet unnamed narrator. Some chapters follow Oscar through high school and onto college. Some stories shadow Oscar’s sister through the difficulties of balancing love and life and family. And many stories take us to the source – the Dominican Republic. Stories not only of Oscar’s mother as a girl, but of her parents. Of Dominican folklore and political history. Of both Oscar and her sister as they make private sojourns to their homeland. This is part of the genius of this book, I believe. You never know who will be telling the story or where the story will take you, but I was always interested to see where I was going. The relationships between characters run deeper than the reader can possibly discern from a single reading, and Oscar, the character to whom the book returns to again and again, slowly crawls his way from socially awkward teenager to socially awkward but semi-heroic man. This is a seriously good book. Ask the folks who hand out Pulitzers. Buy this for: Big Readers who don’t shy away from a challege, those with affinites for adult books that feature young adult characters, and anyone with a taste for Magical Realism. Nice review. I like your “big readers” recommendation – very fitting. Not an easy book but worth the effort to read it through.